« Local News — Not! Editing on an iPad, Anyone? Call me slow, but I finally watched Steve Jobs’ iPad keynote last night (it’s now available on Apple’s home page — or here). The iPad looks like it’ll be a very nice way to watch movies or read digital books, and Jobs offered a typically masterful demo of those capabilities. But what I didn’t expect was the focus on content creation. That came from Phil Shiller, who showed Pages, Keynote and Numbers. Apple made a radical decision with the iPad, focusing entirely on a touch interface. That may seem like a natural extension of the iPhone, but you’re going to do different things with an iPad, and your fingers work differently than a mouse. A mouse is way more accurate, but it’s monotonic, with only one active region at a time. With multi-touch, you lose precision but you gain the ability to track gestures and activate multiple contact points. In terms of human-machine bandwidth, it’s probably a wash — but to make touch work you need an interface that’s tweaked differently. So Apple has quietly redesigned all of its core applications with bigger buttons and new interaction models that let you quickly do what you want with your fingers. There’s a focus on presenting you with exactly and only the tools you need for any particular task, and that ain’t as easy as it looks. Watch, for example, how Shiller selects multiple slides and moves them around as a group (at about 1:01:00). Or how he matches the size of two images by touching them simultaneously. Or does live wrapping of text around an image (at 1:05:00). Or moves columns of figures, or uses a soft keyboard with just the symbols you need. 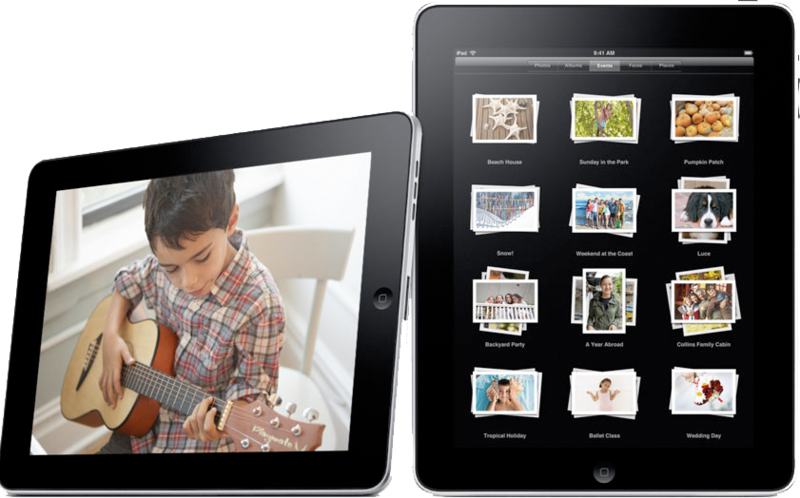 There’s no version of iPhoto for the iPad yet — editing an image will certainly take some unique UI work — but it seems clear that we’ll see one soon. And so, we come to the question of post production. Would the iPad work for heavy duty editing? Unlikely. The screen is way too small, and there’s no disk interface, no Finder. But for putting together home movies while on vacation and uploading them directly to Youtube? It seems like a natural. The question is what might happen when pros start playing with an interface like that. As the song says, once they’ve seen gay “Paree” — how ya gonna keep ’em down on the farm? This entry was posted on March 24, 2010 at 6:57 am and is filed under Apple, Laptop Editing, User Interface. You can subscribe via RSS 2.0 feed to this post's comments. You can comment below, or link to this permanent URL from your own site. That’s what I’m sayin’! The company that embraces touchscreen technology in non-linear editing first is going to be at the forefront. Imagine having a KEM-like bench/ desk with two touchscreen monitors built in that you can work on. Does anyone remember “Touch Vision”? Same sort of contraption as Montage and Ediflex but with touch screen interface. I cut a TV series on it in about 1990. It had some great features especially slip and slide. It died on us and we moved onto an a very early Avid that didn’t have enough credits to be chosen initially…. it came through with flying colours. Touch screen is very exciting for those of us with mouse rendered RSI in our arms. Yea, that’s the general idea. If the monitors were big enough and the UI were modified to offer big target areas for your fingers, I think it might be pretty sweet. I thick that apple should used the same interface from the ipad and used it for the mac pro family. I think they should design a 50″ mac pro screen with a touch screen. I think a big challenge in creating a touch interface for editing will be maintaining the efficiency you get from the keyboard. There are a lot of functions that are best accessed with a single press of a button. You can make up for some of it with gestures, but many will need to move from the keyboard to the touchscreen and be visible and available at all times. It would probably be very much like using a kem. The UI design approach would be something closer to the control panel of a machine than a computer UI. Yea, that’s a big issue. It’s not just the speed that a keyboard gives you, it’s the universality — everybody knows how to use one. I suspect that you’d always have a keyboard along with your touch interface, if only for entering text. For producers doing assemblies, this would be just about unbeatable. I followed your link to the Loilo website. The technology is very intriguing, but I am on the fence about whether or not something like this has potential for film and video editors. I definitely agree with you that a large screen would be a necessity for such an interface, and therefore mobile devices like the iPad would be out of the question for any serious, professional project. Secondly, with the explosion of high-definition video, a mobile device surely would not hold up to the processing and memory requirements necessary for professional editing, even if it did have a full-fledged operating system and disk interface. I also agree with you that mobile devices could be a nice touch-based option for the casual content-creator, however. In terms of professional editing, I think it mostly would come down to efficiency versus creativity. On one hand, I do not see a touch UI making editing maneuvers any faster than they are via keyboard. In fact, I would expect quite the opposite. I believe efficiency in post-production is important for two reasons. First, one can maximize their clients time and money, and secondly, less time is wasted with the software and the editor spends more time being creative with the material. Do you think touch has the possibility to actually enhance creativity? Perhaps it is a bit of a stretch for an analogy, but in the same way some editors are nostalgic of the days of film when editing was more tangible and physical with the actual media? Perhaps touch gestures would emulate that experience of interacting with the media in a physical way, instead of just mentally. For people who are more tactile than visual, maybe physically dragging media around a screen to make edits would spark creative processes that working in a standard keyboard and mouse NLE would not. Lastly, if not applied to editing itself, perhaps touch still has a place in post-production. I was recently in a post-house in Minneapolis that utilized a virtual patch bay instead of a physical one that could connect machines and decks via touch, even bring up and scrub through dailies off the network with multi-touch gestures, all on the same screen. It was very impressive. Interesting topic, and thank you for this post. Yes, I agree. I don’t really expect anybody to work without some kind of keyboard. A KEM had a keyboard, too (essentially a JKL pad) and for good reason. Because a lot of what we do requires you to precisely hit a spot, and feeling the keyboard feedback helps yu do that accurately. But I do think the touchscreen might replace a mouse. I think the issue with regard to creativity is human-machine bandwidth: how precise and quick is the feedback between you and the machine. To conceptualize this, think of a case where there’s very poor feedback. Say your word processor only shows you what you typed a second or so after you hit a key. Even that small delay would make it nearly impossible to use. Or think about editing by dragging a mouse cursor in the timeline. It works, but it’s not really precise enough because it doesn’t tell you how a cut will feel at play speed. I think a touch interface could be very nice for trimming because it could give you more hand/eye/machine feedback. But it has to be very precise — very fine grained and very responsive — or the mouse will still be better. I expect that we’ll see some kind of hybrid develop. And it’ll be very interesting to revisit this in a year or so after people have spent some time with the iPad. It’s funny that the Lolio interface still uses a timeline. iMovie sorta left that behind a few years ago. The value of these simple interfaces will only work if the media and the “timelines” can be exported in some way to a more sophisticated system. That way, we’ll have the ability to have field producers preselect and construct rough cuts — for news, for screeners, for trailer companies, etc. Even rough cuts for us as editors. Then, by simply sending us the timeline, we’d be able to hook it up to our own media (when we need to) to do the fine cut work. Not all editing needs to be complex. There are varying phases and it would be great to have varying platforms. Instead of thinking of the iPad as a replacement for the computer think of it as purely an input device with controls which can reflect content. With an app the iPAd could connect to an application and be a large interface with a bevy of controls which reflect edits as you use them without taking up your main screens real estate.